The team multiplier is a number shown on the top of the screen during coop multiplayer to indicate the number of times the score received when a mutant is taken down. The number ranges from x1 to x100. The team multiplier is increased by 1 when any mutant is killed (except kamikaze-caterpillar) and reduced by 1 when any player is hit by the mutants. It is reduced by 10 when any player dies. It is the number of hits that counts, not the magnitude of the damage one takes. So the ranged mutants and kamikaze-caterpillars are some troublesome mutants that do not deal a lot of damage but can reduce the multiplier a lot. Wasps in particular, can be the bane of your attempt to reach a high score if you are not careful enough. The moment you get hit by a wasp you risk getting swarmed by mutants. When this happens it is better to use a shockwave to escape from them and prevent the multiplier from dropping any further, than to try to keep yourself alive with medipacks and heavy armor. This is why most players who want a shot at a high score choose to use armor with higher speed and lower defense in order to outrun most of the problematic situations they may encounter. 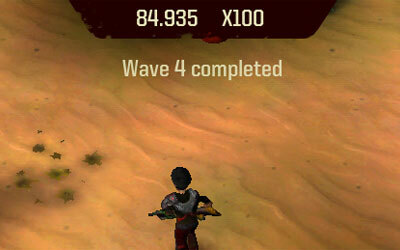 When a mutant is killed, its base score is multiplied with the team multiplier after the increment. That means when you kill a mutant at x1, the multiplier will be increased to x2, and the base score is multiplied by 2 instead of 1. While at x99, the multiplier is increased to x100 after you kill a mutant, and the score of that particular mutant is multiplied by 100. However at x100, the multiplier is capped and cannot be increased further. So killing a mutant at x100 would still give you 100 times the score, instead of 101 times. The implication of which is that once you reach x100, you can afford to get hit once, in between kills, without affecting your score. Therefore, it is not necessary to avoid all hits in order to get a perfect score. To move up the Game Center scoreboard, the team has to cooperate and avoid enemy fire as much as possible so that the multiplier remains high. It is easier to do so in earlier waves of the game but requires much skills in running and gunning when in later waves of the game. One advice is to stay with your teammates and run as a group so that you can help take out the mutants that come too close to them and vice versa. If you are aiming at a high score, you will need to keep the multiplier as close to x100 as possible through all 21 waves.